THPBlog: Green Diamond Resource Company to clearcut near Trinidad, CA. Green Diamond Resource Company to clearcut near Trinidad, CA. This THP is about 2.5 mi NE of Trinidad, CA and Highway 101 at an elevation of 330 to 1,380 feet. 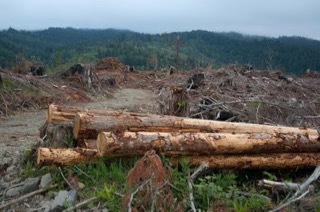 Green Diamond Resource Company is planning a mostly clearcut feller buncher, cable and shovel logging operation on steep and unstable slopes in redwood, Douglas fir and Sitka spruce forests. There are several landslide complexes in unit B including a debris slide slope bound by 2 dormant to active slides along the NW side of the unit, and several active to dormant slides along the SW side of the unit. Green Diamond Resource Company wants to re-construct a segment of road on slopes over 50% grade within 100 feet of a watercourses in unit B. Five road drainage sites are planned for work including rocking, dip construction, culvert repair/replacement and re-construction of washed out crossings. There are 2 osprey nests; including an osprey nest within .25 mi of several haul roads, units B and C, and an osprey nest within .25 mi of unit D and a haul road. Spotted owl nesting territories are located within .25 mi of unit A, and .5 mi of unit B. More information is available on the THP Tracking Center website.